“There’s a strong link between financial support and student research success. This story appears in the spring 2018 issue of 360: The Magazine of San Diego State University. Fernanda Figueroa enrolled at San Diego State University determined to have “the whole college experience.” Her resume proves the point—she is president of the Imperial Valley Associated Students, a campus ambassador and vice president of the psychology club. A scholarship helped her finance a summer 2017 study abroad experience in Milan. But there was one piece of “the whole college experience” that Figueroa never anticipated. She fell in love with research. Linda Abarbanell, an SDSU psychology professor, recognized Figueroa’s talent and asked her to join the Culture and Cognition Lab, which examines the interaction between language, culture and cognition. Guided by Abarbanell, Figueroa is studying how cultural beliefs along the U.S.-Mexico border influence the causal treatment choices that cancer patients endorse. 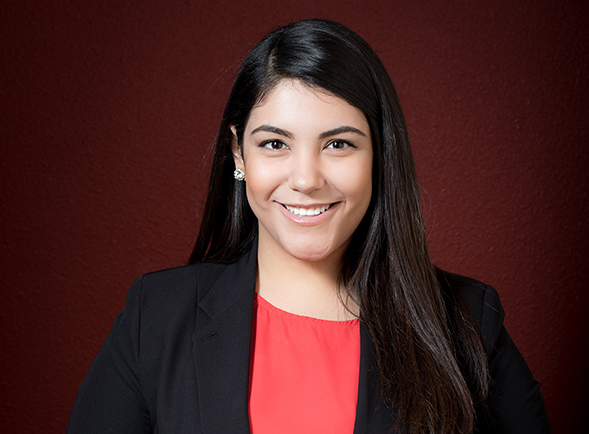 Abarbanell also helped Figueroa find SDSU scholarships to support her research and alleviate the pressure of holding multiple jobs to finance her education. Then Figueroa was accepted into SDSU’s undergraduate summer research program, which funded the 200-plus hours she devoted to expanding data gathering. With more robust data to support her findings, Figueroa presented at SDSU’s Student Research Symposium (SRS) this year and won a top award for her research. “I was in shock. Dr. Abarbanell told us to go for the experience and not set our hopes on winning,” Figueroa said. “So I thought about it as a great opportunity to prepare for the future, because I want to get a master’s degree in clinical mental health counseling and improve access to treatment for San Diego’s Latino community. There is a strong link between research success and scholarship support. More than 15 percent of SRS participants receive financial aid from SDSU, and that’s no coincidence. During The Campaign for SDSU, donors gave more than $190 million to finance student scholarships. Their generosity allows SDSU to award about 19,000 scholarships annually. Some are merit-based; Others support students in specific disciplines or fields of research. Scholarship support alleviates some of the financial burden for students and gives them time to participate, as Figueroa does, in co-curricular activities that build leadership, research and public service skills. Ricardo Desantiago resumed his education after working for several years at an oil company, where he saw first-hand how human impact accelerates habitat degradation. While studying at San Diego City College, he took part in a National Science Foundation research experience to determine whether fish were consuming the microplastics that made their way into local salt marshes. After transferring into SDSU’s environmental science program, Desantiago received scholarship support that allowed him to focus on completing his degree and working in Professor Jeremy Long’s ecology lab. “The scholarship freed me from having to take days off from my research,” he said. This fall, Desantiago will become a Ph.D. candidate in SDSU’s joint program with the University of California, Davis. He plans to study plant-to-plant interactions in local salt marshes with the broader goals of leading local conservation efforts and encouraging underrepresented students to join the STEM disciplines. Madison Kennedy’s SRS presentation described her work with Christal Sohl, a biochemistry professor whose research ultimately aims to develop platforms for targeted drug therapy. Kennedy’s presentation earned the President’s Award, the top accolade for SRS participants. “Working for three years in Christal Sohl’s lab helped me become the scientist I am today,” Kennedy said. 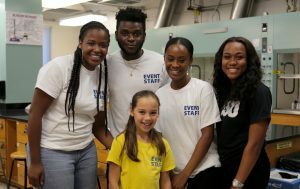 As she prepares to graduate, Kennedy is weighing offers from several Ph.D. programs, including the University of California, San Francisco, the University of Washington and Vanderbilt. At the same time, she’s reflecting on the opportunities that were available to her at SDSU.